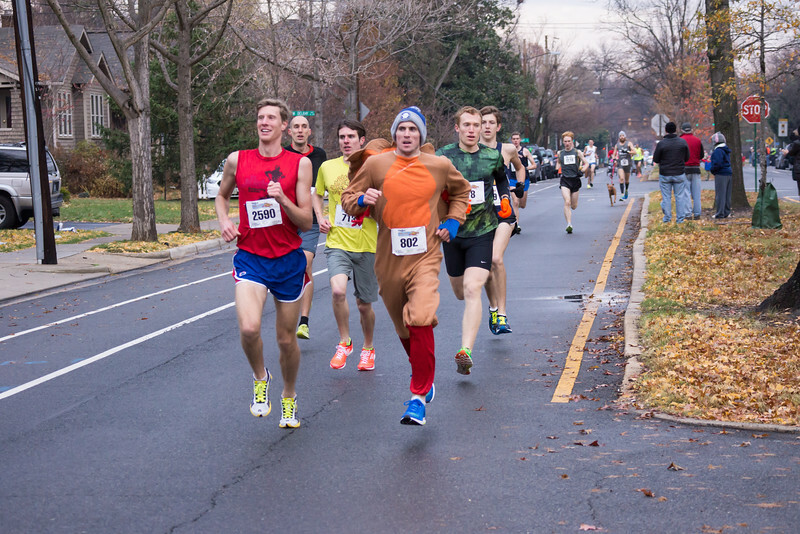 On a holiday renowned for gluttony, the winners at the Alexandria Turkey Trot ended up getting just enough, not too much. For Kevin McNab, it meant a narrow win over Georgetown University cross county runner Collin Leibold, both timed at 24:32. For Susanna Sullivan, all she really needed was one second by which to break the women’s course record — 27:13. All the excess came in the turnout, the race’s second biggest in its 39 years. Nearly 4,000 participants finished, and their entry fees went to benefit the ALIVE food charity. [button-red url=” http://www.zippyraceresults.com/search.php?ID=4538″ target=”_self” position=”left”] Results [/button-red]The flat, fast five-mile course traverses the streets of Alexandria’s Del Ray neighborhood. It’s a holiday tradition for families and friends, with a robust dog and stroller contingent. Dedicated residents set up cheering stations in their front yards or along sidewalks to cheer the runners on, their only defense from the cold their winter coats and a bloody mary or two. The race includes a number of sudden turns through the neighborhood, so includes a fair amount of blind spots for the front running contingency. McNab, of Washington, D.C. leaned in over Leibold, but it didn’t look like it would be that close early on. Twenty seconds behind the lead pack for the first two miles, “I was in no man’s land,” McNabb said, between the first group and another contingent behind him. He closed the gap between three and 3.5 miles and unfurled at a punishing pace from that point on. It was an elbow-to-elbow scrum of seven runners until the very end. The finish line is a quick veer into the George Washington Middle School’s parking lot, and it came as a surprise to McNab. Leibold, too, was caught off guard by the finish line, saying that he “wasn’t expecting it because it wasn’t starting to hurt yet.” The pre-med major is getting some extra races in after a season shortened by injury. Sullivan defended her title from 2013, a gratifying win after what she called a “wild fall” which included more time in the pool than the roads due to a stress fracture in her shin. She and second place finisher Mahlet Melese fought it out for a mile and a half but Sullivan pulled out all the stops in the final quarter mile. Local legend and elite ultramarathoner Michael Wardian made a new record-breaking effort. He placed first in the 40-49 age group as well as the dog category with his one year old Viszla, Rosie in 27:38. He “let her control her own pace,” said Wardian, who was beaming with pride at his puppy’s debut. While the Alexandria Turkey Trot did not have an official running with dog record category, consensus was that Michael won it, and if next year’s race includes a canine category, Rosie will definitely be the bunny every pup is gunning for. Of course it wouldn’t be a turkey trot without someone dressed like a turkey, and Alexandrian John Galer not only delivered, but he upped the stakes a little by assembling a team of four pilgrims to chase him. Designated the turkey by the group of 5 because he was fastest, John finished first and waited at the finish line as Emily Galer, AJ Menton, Aanan Patel, and Mike Lucas trickled in. The group’s plan for the rest of the day consisted of a pilgrimage of sorts – a four-stop Thanksgiving tour of the District and Alexandria. The group, who has been celebrating “Friends-giving” for close to a decade, thought that their pre-emptive calorie burn was sound preparation for their day-long travelling feast. Wherever they end up, the closing note of the tradition is to wind up the night with a viewing of Home Alone, to signify the beginning of the Christmas season. Whether racing all out for a course record or enjoying the celebratory atmosphere, the participants of the Alexandria Turkey Trot started off their holiday in festive five-mile fashion.